The Olive Garden definitely has an abundance of craveable Italian dishes on the menu. 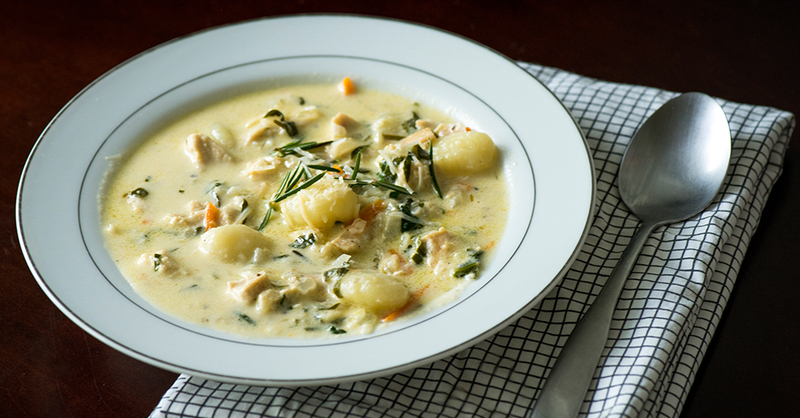 While we do enjoy eating out on occasion, we absolutely love creating copycat versions that we can enjoy at home, and this gnocchi soup is no exception! It’s loaded with fluffy little dumplings, juicy chicken, and plenty of veggies, swimming in a decadent, velvety-rich broth. Sometimes, during those cold winter nights, when the vast majority of color you have seen is white, you need a great tasting, warm, delicious soup to put everything back into a good perspective and help you remember that spring will be on your doorstep before you know it. Even though the deep flavors make us think it took hours to make, it actually comes together quickly, making it a perfect weeknight dinner to warm us up from the inside out! If using store-bought gnocchi, bring a large pot of salted water to boil and cook according to packaging directions. If using homemade, cook until gnocchi float, then remove with a slotted spoon. Set aside. Heat olive oil in a large pan or skillet over medium-high heat and saute onion and carrots until softened, but not browned. 5-7 minutes. Add minced garlic during the last 2 minutes and cook, stirring frequently, until fragrant. Season with salt and pepper and rosemary, and add chicken. Cook until chicken is lightly browned and coated in cooking juices. In a separate bowl, stir together heavy cream and parmesan cheese until there are no lumps. Reduce stovetop heat to low and add parmesan cream mixture. Sprinkle in nutmeg and let simmer for several minutes, or until thickened. Add gnocchi to the mixture and cook until warmed through and coated in sauce. Remove rosemary sprigs and serve immediately, garnished with more cheese.